We invite you to take a tour of our office! 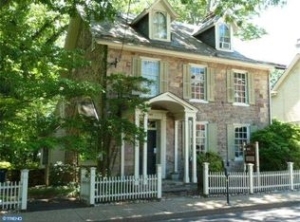 We are located at 140 East State Street on the first floor of a beautiful gray, stone house. We have plenty of toys to keep children engaged in the waiting room. Help yourself to a cup of tea and enjoy the relaxed atmosphere of our office where we truly hope you feel at home! Your First Visit – The first appointment is scheduled for approximately 45 minutes, leaving time for an exam, adjustment, and any questions you may have. The doctor will take a thorough health history, get to know your needs, and answer your questions before adjusting you. Please bring your completed paperwork and insurance card (if using insurance) to your appointment and be sure to arrive about 15 minutes early so we can welcome you and show you around! Your Second Visit – This appointment is scheduled for 30 minutes and is usually scheduled a couple days after your first visit. This allows the doctor the ability to see how your body responded to the adjustment. During this appointment, the doctor will review their findings and your care plan. A folder with specific handouts pertaining to your health concerns and subsequent recommendations will be handed to you. It is recommended that new patients schedule out to their re-examination at this time, in order to make sure they get to choose the appointments that work best with their schedules. Additional Visits – After your first two visits, each follow-up appointment is scheduled for 15 minutes. Because of this, it is very important to be on time so that you can get the full benefit of the visit. At these follow-up visits, the doctor will adjust you and together you’ll discuss your progress and next steps. Cancellation Policy – We require 24 hours notice to change or cancel an appointment. Failure to provide 24 hours notice will result in a $60 cancellation fee. Additionally, if you are more than 10 minutes late for an appointment, we cannot guarantee that you will be seen, and you will be responsible for the cancellation fee. We do our best to be flexible and accommodate everyone’s schedule. Thank you for respecting our policy.